Shingles is a large house near the center of the popular holiday destination of Sandown. The house consists of a fully equipped kitchen, a large lounge with sofa bed, 2 bedrooms and a bathroom. The house sleeps up to 6 people. The house is set in its own garden enjoying privacy of its grounds. Private spacious parking is provided. The house has gas central heating throughout and double glazing. All bed linen is provided. To keep a fresh smell about the property the house is a non-smoking area. Before every changeover the house is cleaned thoroughly to ensure a fresh feel before your arrival. The property is available all year round with prices from £300 per week to £600 in the mid season. Change over is on Saturday, the property is to be vacated by 10am and entered after 2pm. Every year we invest a lot of time and money on the property to bring you the best relaxing and enjoyable holiday we can achieve. Shingles is located in a peaceful district of the holiday town of Sandown. 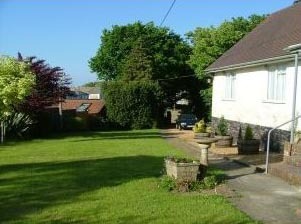 The centre of the town with its busy commercial high street is approximately a 10 minute walk from the house. The popular golden sandy beach is a short walk from the house following the scenic cliff path. Just around the corner from the front gates of the house is the tranquil Sandown battery gardens and children’s park. Within a short walk from the house is Sandown leisure centre and a number of recommended bars and restaurants. You can view a detailed street map of Isle of Wight here - Isle of Wight Map, get the latest weather here: Isle of Wight Weather, and more information about Isle of Wight here: Isle of Wight Guide. You can check out the latest Isle of Wight jobs here: Isle of Wight Jobs.